First of all we want to let you people know, that the incomplete truth is always & always more dangerous than a complete lie. Now a days on the social media, there is this viral message going about giving a miss call to 1800-5320-295 to get Rs. 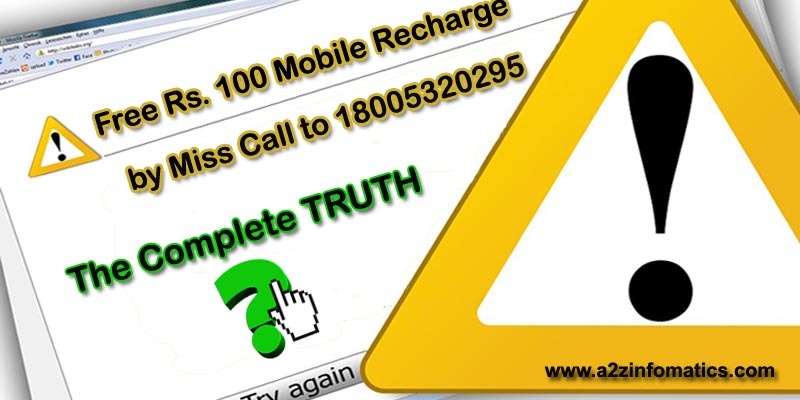 100 free mobile recharge. We just want to ask you people a simple questions, does this make any sense to you ?. What is the reason behind this loot offer ?. Actually nobody has any logical answer for this, people in this wonderful country are just crazy to catch any free stuff on their way. Sadly, majority of the population has already gone to collect this Free Mobile Recharge worth Rs. 100 by Miss Call to 18005320295 loot offer. Today, we are here to expose the truth behind this free mobile recharge HOAX. Free Mobile Recharge Offers of Rs. 100 – 200 – 500 by Miss Call to Toll Free 1800-????-??? Numbers – Truth Behind the Scenes. Actually, at the time of Chennai Flood, there was a combined initiative by CNN-IBN and Mobikwik to provide Free Rs. 30 mobile recharge to the Chennai Flood Victims. This was really a good initiative to help the people affected by the natural disaster. To cash these sad moments, some crazy minds had publicized this free mobile recharge offer, available to all users of the country. Later they raised the free recharge amount to Rs. 100 to attract more people from the community. Below is the actual / original Rs. 30 free mobile recharge offer by CNN-IBN and Mobikwik. 1)-Free Mobile Recharge worth Rs. 30 by Miss Call to 1800-5320-295. The related user just have to make a Miss Call to the Toll Free no 1800-5320-295. The call will get disconnected by themselves and the user will receive the below confirmation message on the mobile. Welcome to the ModiKwik & CNN-IBN free Rs. 30 mobile recharge initiative. Your missed call has been registered successfully. Rs. 30 recharge on your mobile number will be done within 24 hours. 2)-Free Mobile Recharge worth Rs. 30 by sending a SMS to 51818. The user has to Type “RECHARGECHENNAI <Victim’s Mobile Number>” in the message body and send it to 51818. Note: The user will get the confirmation message once request is successfully registered. 3)-Free Mobile Recharge worth Rs. 30 by sending a Tweet on Twitter. The user has to tweet <Mobile Number> with the Hashtag (#RechargeChennai) @ibnlive. We guess everybody is now fully agreed with the “incomplete truth” quotes used earlier in this post. The crazy mind peoples has removed the actual reason & actual free recharge amount from the offerings and presented this in a totally different gesture, to the loyal social media & internet community. In simple words, ridiculous things will never stop happening is this country. Be careful next time, if there is another viral social media message about Free Mobile Recharge worth Rs. 1000 by Miss Call to <any fake number> . Free Mobile Recharge worth Rs. 500 by Miss Call to 1800-2126-677. Complete Offer details according to the Offer Promoter. 1)- The user has to dial 1800-2126-677 on any Mobile Network. 2)- Once you make the call, it will get disconnected by itself and the user will get registered for the free mobile recharge offer. 3)- Within 2-3 minutes, the user will get a call back and has to provide any five random numbers. 4)- Now, if the provided random number are correct, the user will get the below confirmation message. Congratulations! to provide the valid Offer Code, You may receive a free mobile recharge of Rs. 500 within 48 hours. Important: Please don’t get messed up with any of the Free Mobile Recharge Offers. The above Offer is a HOAX too as the first offer. You may like: Truth – Reality about Narendra Modi’s Clean India Mission. These false offers will keep coming on your way in this modern world, nobody has the control to stop these type of activities by the freaky minded peoples. Just use your common sense and investigate the reasons behind that happening, you will know the truth yourself. That’s it for now, if you know any more false “free mobile recharge offers” please do share the same under the comments section below. We will investigate those offers and will update this post accordingly. Thanks for your time, Think big, stay SAFE, God Bless Everybody.